Weekends are for slowly cooked meals. Meals that emit utterly delicious aromas throughout your home for hours that once it’s finally finished cooking, you can barely wait to tear into it. And when you take that first bite, you just know that it was totally worth the wait. This Bolognese fits that bill perfectly. Utterly rich, savory, and meaty. I like serving this with Orecchiette because it’s the type of pasta that can hold up to such a hearty sauce and envelopes the meaty goodness. Yup…I said “meaty goodness” but you can use whichever type of pasta that tickles your fancy. And although this Bolognese does take some time to make, it freezes beautifully. So make a double batch and store the extra in your freezer for a tummy warming, weekday dinner. Heat olive oil in a large heavy pot. Add onions, carrots, celery, and garlic. Saute until softened but not browned. Add chili flakes and sauté for an additional minute. Add beef, veal, and ½ teaspoon of kosher salt. Use a wooden spoon to crumble the meat and break into small pieces. Once the meat is no longer pink, add thyme and bay leaves. Add tomato paste and cook for an additional 2-3 minutes. Add the milk and bring to a simmer. Continue simmering until all the milk has evaporated and only clear juices remain—about 10 minutes. Add the wine and bring to a simmer. Continue simmering until all the wine has evaporated—about 10 minutes. Add tomatoes with its juices and bring to a boil, then place the heat at the lowest setting. Continue on this very low simmer for 2 – 2 ½ hours, stirring every 20 minutes until you get a rich, thick meaty sauce. Check for seasonings and add kosher salt and pepper accordingly. 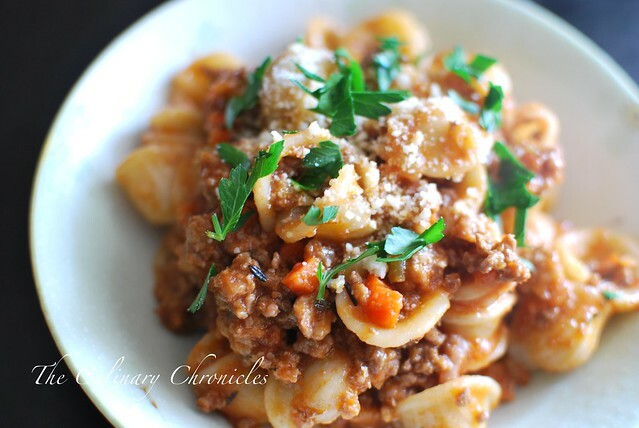 Toss the cooked Orecchiette in the Bolognese sauce and serve topped with Parmesan cheese. Garnish with Italian parsley and Enjoy! Previous Post Spiced Mulled Wine…..and our GIVEAWAY Winner! My heart and soul are two-stepping together at the looks of this. LOVE orecchiette! And love that you used veal with your ground beef. This is such a grown up artsy bolognese. LOVE it Nam! for the long simmer I assume I leave the pot uncovered, can you confirm? This is old cooking… it is like we do in the Mediterranean. Long simmering that makes the sauce even better and succulent 🙂 I love orrechiette. Great post! I made the bolognese sauce last week and it was amazingly good! Can you please tell me the purpose of the milk? Love your recipes and blog. Have a wonderful 2012! Thank You so much! I’m glad you enjoyed the sauce 🙂 The milk provides that extra richness to the sauce. I’ve omitted it before and it definitely changed the profile of the dish.